Plant It Forward Farms is a Houston nonprofit founded in 2012 that helps refugees build sustainable urban farms. Photo courtesy of Plant It Forward Farms. Teresa O’Donnell built her 2015 TEDx talk around a simple question, “Can an urban farmer earn a living wage?” O’Donnell is executive director of Plant It Forward Farms, a Houston nonprofit founded in 2012 that helps refugees build sustainable urban farms. The idea for Plant It Forward came while O’Donnell was looking for ways for her software company to give back to the community. She became interested in the plight of refugees and helping them build businesses after reading about how actress Tippi Hedren had helped Vietnamese refugees gain the business skills necessary to open nail shops in Southern California. O’Donnell said she came across the concept of Market Gardening and discovered urban farming could produce enough income to sustain a family. The organization has expanded to include a total of 6.5 acres. Nine of the farmers are still managing farms on the land, which is spread across four farms in the Houston area. O’Donnell said once funding is secured the group will build a new training farm that will train additional groups of 14 farmers. The organization’s overhead and expansion efforts are sustained largely by private donations and grants, O’Donnell said, although the farms themselves are self-sufficient through their weekend market stands, CSAs and participation in farmers’ markets. One of the successful farmers is Alimasi Toto, a farmer from Kinshasa, Congo. He and his family sought asylum in Houston and he now runs his own farm to support his family. “When I was in Africa, I [farmed] but not as a business. It was mostly for my family. I find this opportunity was good for my life. I eat French vegetables and the weather in Houston is almost the same as my country,” he said. Toto said the program helps with more than farming and entrepreneurial skills. His family also gets help with the cultural transition from the French Congo to the United States. 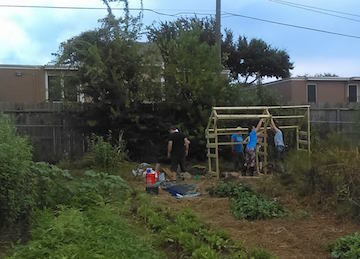 O’Donnell said most of the farmers from the original training class are still with the organization, despite the challenges of maintaining an urban farm in Houston. Individual farms can be created with plots as small as two-thirds of an acre, O’Donnell said. Once land is sectioned off for a farmer, volunteers often come in to help clear the ground and prepare the beds, while the farmers themselves manage the planting and harvesting. “We have three staff members and a bunch of volunteers—over the course of a year probably 600 people,” she said. Interest in the program runs high, and O’Donnell said they’re optimistic grant funding will be awarded to start the new training farm to enable them to bring more farmers into the program.